Please specify PARK NAME when sending/leaving a message. 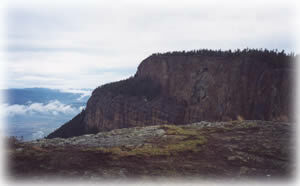 The Enderby Cliffs tower high above the Shuswap River offering breathtaking views of the Shuswap and North Okanagan regions. Hikers atop the cliffs can take a step back in time to the Tertiary age and watch the soaring birds play on the updrafts created by the steep rock face. Special Features: Cliffs, volcanic rock and fossil sites. The park is open year-round with services from April 5 to October 27. Caution: Falling rock from the cliff face is very common. Hikers are reminded to stay on designated trails and avoid areas below the cliff face. Use caution on steep sections of trail and where the trail surface is loose. Keep children under adult supervision where the trail winds atop the cliffs. Horses and/or horseback riding is not permitted. Turn East onto Mabel Lake Road. Continue for 2km down Mabel Lake Road and take a left hand turn onto Brash Allen Road heading north. At 1.4 km, Brash Allen road forks – stay right and continue down the unpaved road for 1.6 km until you reach the parking lot on the left, which is also where the Tplaqin trail begins. History: The protected area was established on April 18, 2001 as part of the Okanagan-Shuswap LRMP process. Conservation: Enderby Cliffs Protected Area was established to provide increased representation of transitional biogeoclimatic units in the North Okanagan Highlands and North Thompson Uplands ecosections. The area also conserves prominent rock cliffs of the Tertiary age. Small, scattered stands of old-growth Douglas-fir and larch are found within a variety of successional forests. Sagebrush and rabbit brush occur at uncommonly high elevations. Wildlife: The protected area provides key mule deer winter range. It also contains habitat for moose, cougar, bobcat, lynx, marten and grizzly. A variety of birds and bats inhabit the cliffs, including white-throated swifts, golden eagles, grouse, and song birds. Reeves Lake is a small lake popular for trout fishing. The terrain around the lake is quite wet and marshy, though there are a couple good dry spots for fishing. Very large skunk cabbage and lily pads are the dominant vegetation. Anyone fishing or angling in British Columbia must have an appropriate licence. Motorized vehicles are not permitted at Reeve’s Lake or other areas of the park. For your own safety and the preservation of the park, obey posted signs and keep to designated trails. Shortcutting trails destroys plant life and soil structure and may adversely impact water quality in the community watershed. Directions to the trailhead: The trail is for hiking only; no horses, motorized vehicles or mountain bikes are permitted. To access the trailhead, turn East onto Mabel Lake Road and continue for 2km. Take a left hand turn onto Brash Allen Road, heading north. At 1.4 km, Brash Allen road forks – stay right and continue down the unpaved road for 1.6 km until you reach the parking lot on the left, which is also where the Tplaqin trail begins. Description of the trail: Recently upgraded through a collaborative effort with Splatsin, the Shuswap Trail Alliance and BC Parks, the Tplaqin trail winds its way to the summit on a well laid-out and maintained single track surface. The trail emerges from forest cover in a number of areas affording hikers sweeping vistas of the valley below, before finally reaching the top of the cliffs and the most impressive view of all. This park is open to hunting. Please check the BC Hunting & Trapping Regulations Synopsis for more information. At nearly 1200m, the cliffs tower 850m above the valley floor and offer a terrific view of both the Shuswap and the Okanagan Valley.